Discussions on Germany at European level invariably focus on the country’s strong economic performance and how this relates to the labour market and broader society. This is a narrative I have myself contributed to in a previous blog piece. However, Eurofound’s European Quality of Life Survey (EQLS) 2016 shows us that, when it comes to Germany - and a number of other developed western European countries - perceptions of quality of society are increasingly divorced from economic performance. Indeed while many indicators continue, as one might expect, to reflect the country’s positions as an economic powerhouse, there are serious signs of growing concerns in other indicators such as perceived tensions between racial and ethnic groups and also between religious groups. Clearly, many aspects of the survey’s findings reflect Germany’s continuing strong economic performance. Perhaps most significant of these is that the share of people reporting difficulties in making ends meet decreased since the previous survey: in 2011 this share was 30%, and it improved almost 10 percentage points since, dropping to 21% in 2016. This is significantly below the EU average of 39%. This improvement in making ends meet is also reflected in a reduction in perceived tensions between rich and poor: 35% of respondents in Germany reported a lot of tension in 2003, whereas it stood at 29% in 2016, drawing Germany in line with the EU average. People in Germany are also relatively satisfied with the quality of their public services. The ratings for all the measured services in the 2016 survey are above the respective EU28 averages. Additionally, many of the services have improved in recent years. For instance, the perceived quality of health services has increased from 6.5 out of 10 in 2003 to 7.3 in 2016; the EU average for 2016 was 6.7. The perceived quality of the education system has also increased from 6.5 in 2003 to 7.0 in 2016. Although the state pension system gets the lowest rating among the seven key public services surveyed, this is a common trend and it is still slightly above the EU average. The perceived quality of social housing has also remained stable since 2011. But if socio-economic and class tensions in Germany are gradually subsiding, they are increasingly being replaced, and superseded, by perceived tensions between racial and ethnic groups. In the 2011 EQLS survey 29% of respondents in Germany reported a lot of tension between groups, this increased to 42% in 2016. This marked increase in racial tension was also observed in a number of other European countries. The reported increase in tension between religious groups was even more significant, jumping from 28% in 2011 to 45% in 2016, and well above the EU average of 38%. People in Germany also feel less secure about their personal safety than in other EU countries; just 22% of respondents reported that they feel safe when walking alone in the dark – compared to the EU average of 35%. A powerhouse for social cohesion? We should bear in mind that these findings are all relative and Germany remains amongst the most politically and socially stable countries in the world. However, the apparent disjoint between quality of life and quality of society, as reflected in the 2016 EQLS, is cause for reflection. 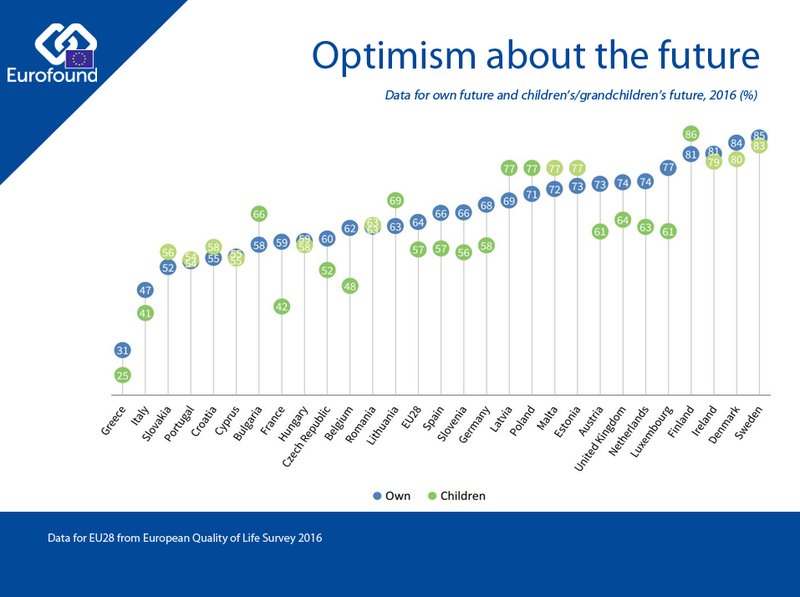 Although Germans remain optimistic about their future, they are less optimistic about the future of their children and grandchildren – and it seems that their optimism is being dampened by societal rather than economic concerns. Germany’s commanding position in Europe in recent years has largely been due to its reputation as an economic powerhouse. Its place in Europe in years to come may well be defined by its ability to also become a powerhouse for social cohesion and integration. The EQLS is carried out every five years, it is a unique, pan-European survey that examines both the objective circumstances of European citizens' lives and how they feel about those circumstances and their lives in general. It looks at a range of issues, such as employment, income, education, housing, family, health and work-life balance. It also looks at subjective topics, such as people's levels of happiness, how satisfied they are with their lives, and how they perceive the quality of their societies. Nearly 37,000 people in 33 European were interviewed in the last quarter of 2016 for the latest edition, with the overview report issued earlier this year.